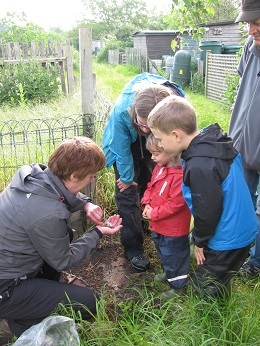 Members of Knighton Wild, some county recorders and other recorders joined forces for a mini-bioblitz at Queen's Road Allotments in Leicester. Around 230 species were recorded from overnight moth-traps and mammal traps and from survey activity from 10.00 am to 2.00 pm on Sunday 27th May 2018. Allotment holders arriving on Sunday morning were greeted by the site of local naturalists walking round the allotment site peering into and under plants and photographing a wide variety of wildlife on the alloments. Some of the records are yet to be confirmed, but we recorded 15 butterflies and moths, sadly not the Scarlet tiger, which had been seen on the allotments a few weeks earlier, about 130 plants, a couple of which hadn't previously been recorded in the tetrad, and a wide variety of other wildlife, including 7 species of slugs and snails. Thank you to all who took part, especially those who were there at 7.00 am to open the mammal and moth traps. A report on the event is being written up. Contact Knighton Wild if you would like a copy.